A taster from my new cook book Healthy Eating for Life due to be published on January 8th 2014–my birthday! 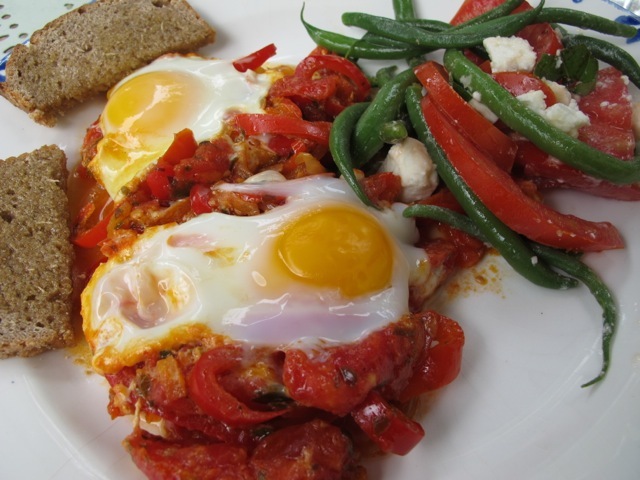 We had it for lunch today–with some green beans, as suggested in the recipe–spiced up with a couple of ripe tomatoes and feta. A traditional North African favourite, this version is adapted from a recent discovery in Ottolenghi’s sumptuous vegetable cookbook, Plenty. 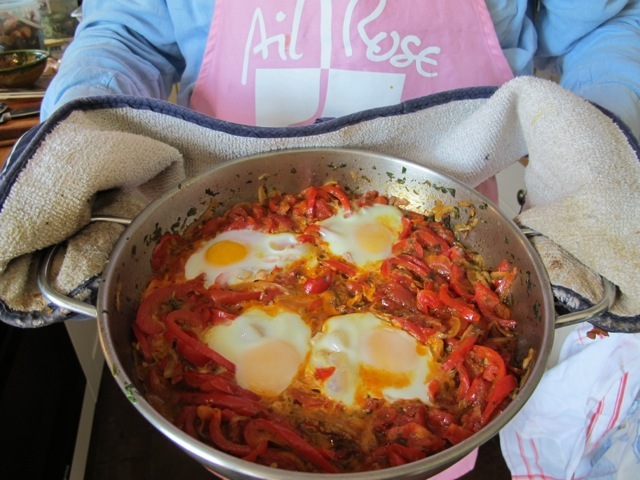 The name means “mixture” in Tunisian–better to stick to Shakshouka I reckon! It is often served in individual cast iron pans, which I imagine adds to the pleasure–one pan and ALL for ME! It makes a pretty picture on the plate—a perfect light summer lunch. Dry roast in a small frying pan the cumin seeds for a minute or two, taking care not to burn them. 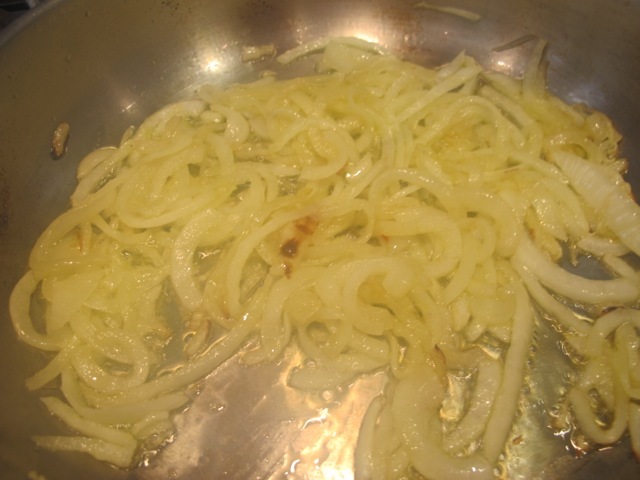 Heat the oil in the pan over a medium-high flame and cook the onion for 5 minutes to soften it. 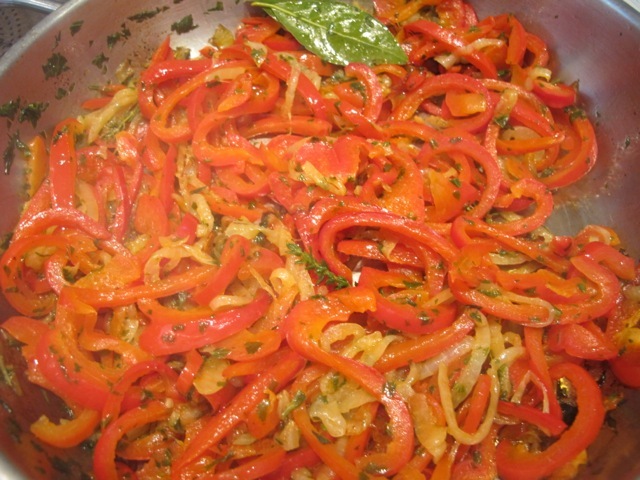 Add the peppers and three herbs (bay, thyme and parsley) and turn everything over thoroughly. 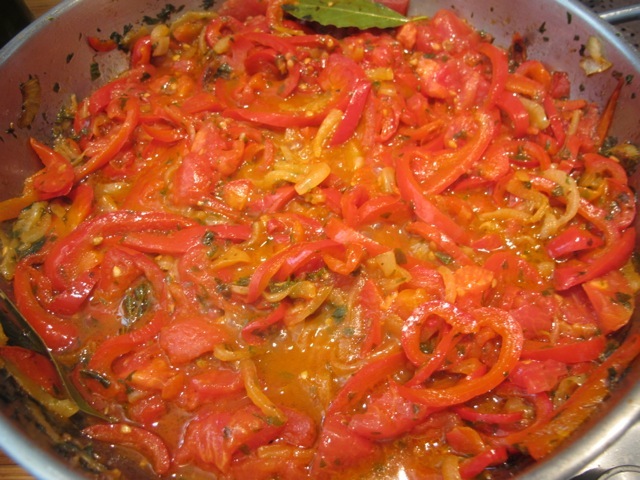 Cover the pan for 5 minutes to start the softening of the peppers. Cook a further 5 minutes uncovered. Add the tomatoes, the water, a little at a time to avoid diluting the sauce, the two spices (cayenne pepper and saffron) and season with salt and pepper. 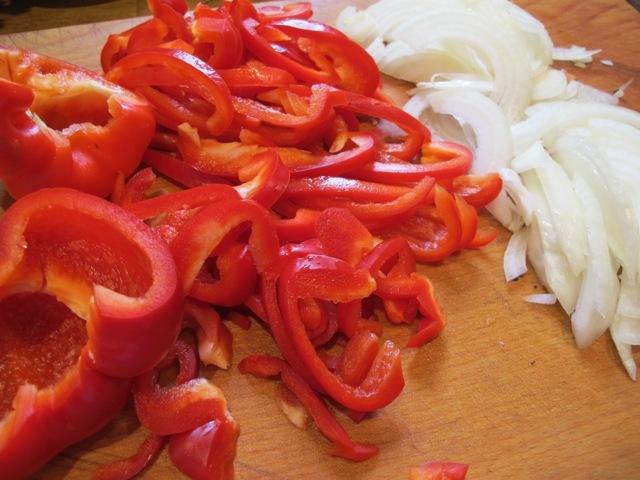 Cook for 15 minutes on a low heat–covering for a short time if you think the peppers need further softening. The result should be a lightly spicy sauce in which to poach the eggs. 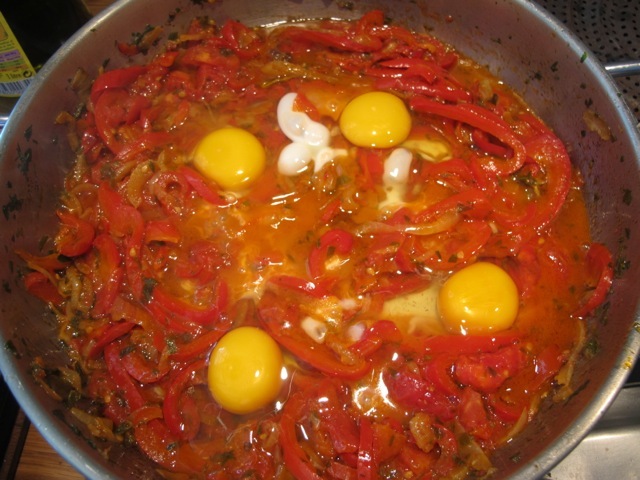 Carefully break the eggs (2 or 4–your choice) into the sauce–leaving space between them. 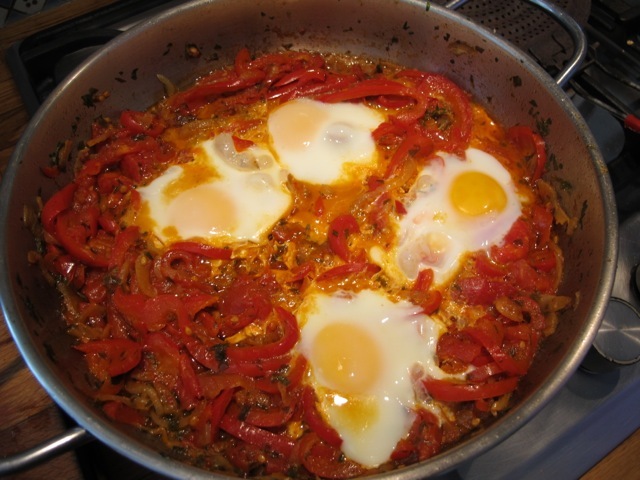 Cover the pan and cook, over a lowish heat, until the eggs are cooked to your taste. Reluctantly–I shared the pan’s contents with Meredith! on August 28, 2013 at 2:26 pm | Reply Dianne P.
Hi Chris–yes but after a couple of minutes perhaps–giving them time to get going. Yum! Will be trying this after next trip to the farmer’s market. Question: Is the oil and onion added to and then cooked in the same pan as the dry roasted cardamon seeds? Hi Helen–cumin seeds rather than cardamon! use the same pan yes (though I use a small frypan to roast seeds) but take the seeds out first to add them when the recipe says. I have a recipe similar to this, with an Italian twist– using basil, mozzarella… and have yet to try it! Your post encourages me to. I reckon that instead of wasting time appearing in Poldark, you should have concentrated on being a chef. (I am joking of course re Poldark) Yummie looking knosh there Robin. I’ll be trying that out this weekend. Isn’t the 8th of January the same birthday as Elvis? A day of great births! I’ve made this twice now with great results and was planning to make it again tomorrow! 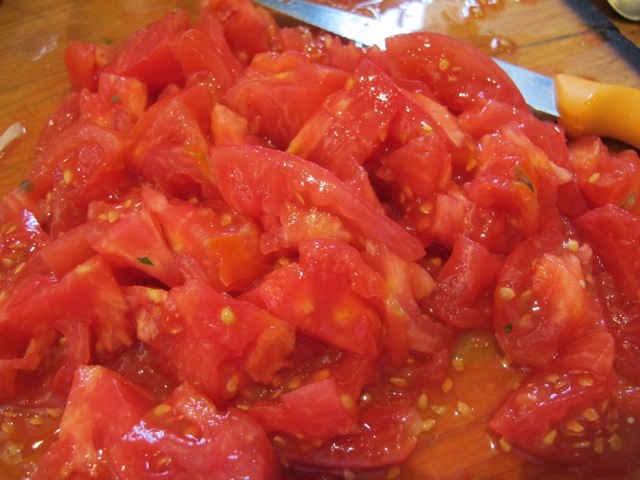 Thanks for re-posting the recipe – I have nice home grown tomatoes that need eating. Can’t wait for the new book. Will it be available in hardback? No Tina, it will be a paperback–about the same size and price as Delicious Dishes. Thanks for posting this. I am always on the lookout for interesting vegetarian recipes and this looks wonderful. You must surely have a doppelgänger as I was just driving down the King’s Road in Chelsea and saw a smartly dressed man at a bus stop who looked exactly like you!!! “Smartly dressed” would be the giveaway–I have striven for that most of my life, Victoria, without much success except when I played smartly dressed characters! I might have been seen standing at a bus stop however. January 8th is my birthday too. Robin, Elvis, David Bowie, Shirley Bassey and Virginia in Delaware. Elvis was a twin and I have identical twin sons. Looking forward to your next book. We could find more–my mother was a twin–nice way to start September, Virginia. Hi Robin, I road-tested this yesterday, for late Sunday lunch, and it was delicious. We had eaten out the night before so this was a perfect meal to replace breakfast. The sauce was warm and spicy, very nice. Neal thought a little firmness left in the capsicum (peppers) was to his liking. I did get confused at which stage you add the roasted cumin seeds? I dry roasted them in a separate pan. So I just added them later in the cooking process. Hi Pamela–I’ll have a look at the recipe again. You were right about the seeds. Glad you liked it and it’s a great late breakfast idea. Say Hi! to Neal. I tried last week this recipe and I added the roasted cumin seeds with the peppers & tomato sauce while they were on fire. The dish is delicious and reminds me something like the Bouillabaisse with eggs (a nice recipe but made with soup).